42 years after its first release, Ken Loach’s second cinematic outing remains a compassionate, powerful high point of low-budget realist cinema. 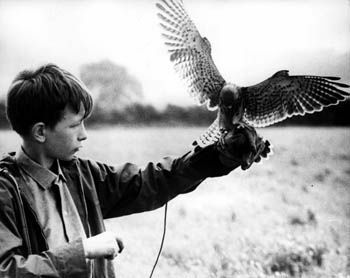 A young Barnsley lad (David Bradley), bullied at school, miserable at home, finds a kestrel chick and decides to care for and train it – and for the first time discovers meaning in his life. Funny, sad, bitingly authentic, Kes resonates with Loach’s anger at the way many kids grow up into narrow, option-free lives. And if you ever suffered on the school playing-fields, you’ll shudder with recognition at Brian Glover’s bullying games teacher.